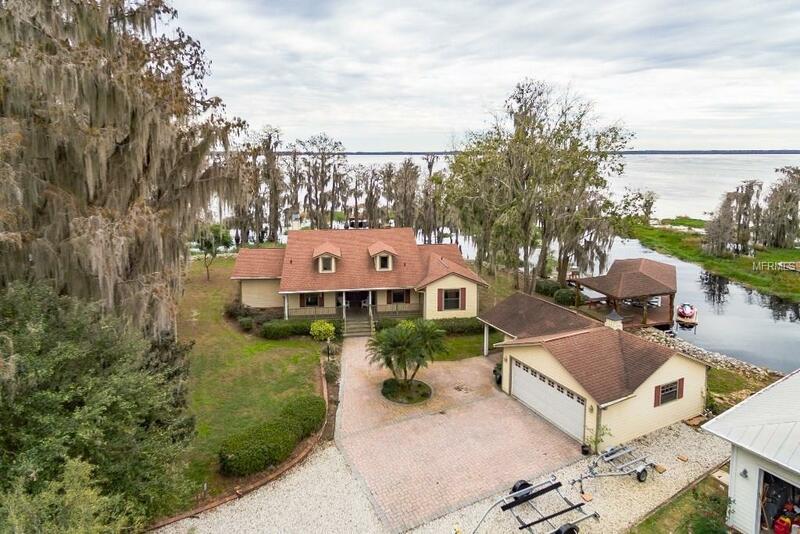 DIRECT LAKEFRONT on Lake Louisa and the Clermont Chain of Lakes! Gorgeous views from the wall of windows along the lakeside, as seen from the Bonus room, kitchen, great room, bedroom 2 and master suite! Wakeup every morning to brilliant sunrises. As the home sits on a point, you have over 250' of water frontage. This includes BOTH a fishing pier/dock on he water with perfect place to relax, as well as a boat dock and lift for a power boat and jet ski! Rocking chair front porch, covered side porch and 2 lakeview decks give you even more places to love where you live! Inside, the kitchen has granite counters, lots of cabinets, a walk in pantry and center island workcenter. As this opens up to the HUGE great room with high, volume ceilings, a gas fireplace with river rock surrounding it, there is ample and beautiful space to live or entertain. Pretty wood flooring in the great room and one bedroom. Master bathroom has a huge walk in shower w/dual shower heads,granite counters,newer cabinetry,and travertine tile.Detached 2 car oversized garage! New roof in 2013, a newer dock on Lake Louisa, new AC handler and even a new irrigation pump (out of the lake Newer washer, dryer, dishwasher, refrigerator and disposal! What a lakefront retreat you can call home every day! As Lake Louisa State Park is almost half of the shoreline south of here, it is a quieter lake, perfect for fishing, boating, waterskiing, kayaking, wakeboarding, etc!Make your appointment to see this home for later, click video link above photo now!